Defense Secretary Jim Mattis said Thursday the U.S. is actively considering sending lethal defensive weapons to Ukraine, which is fighting Russian separatists inside its eastern border with Russia. “We are actively reviewing it,” Mattis said at a news conference with Ukrainian President Petro Poroshenko. “I will go back now having seen the current situation, and be able to inform the secretary of state and the president in very specific terms what I recommend for the direction ahead,” he said. Asked whether President Trump himself would approve sending weapons to Ukraine, which would upset Russia, Mattis said he owed the president confidentiality on what he is advising him. However, he rejected that Russia could see the move as provocative. 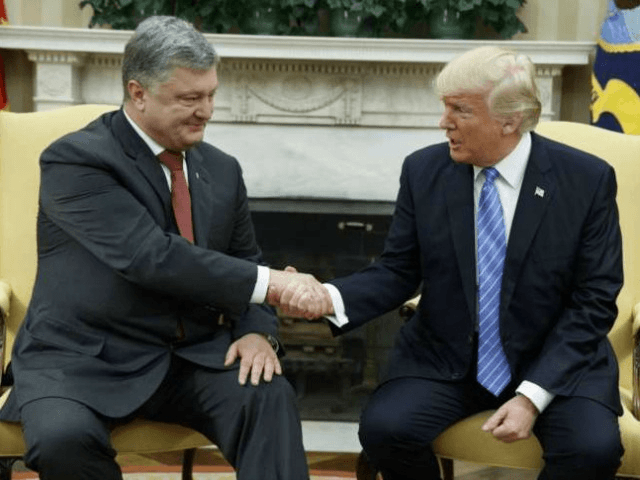 “Defensive weapons are not provocative unless you’re an aggressor, and clearly, Ukraine is not an aggressor, since it’s their own territory where the fighting is happening,” he said. Russia invaded Ukraine in March 2014 and annexed the peninsula of Crimea. Since then, it has supported pro-Russian separatists in Eastern Ukraine who are fighting Ukrainian forces and inflicting high casualties. The Obama administration refrained from providing “defensive lethal weapons” to Ukraine out of concern it would provoke Russia into retaliating. Instead, it sent vehicles, medical equipment, blankets, and other “non-lethal” aid. Senate Armed Services Committee Chairman John McCain (R-AZ) issued a statement supporting the potential provision of the weapons. “Raising the cost of aggression may help to change Vladimir Putin’s calculus, pressure Russia to fully comply with the Minsk agreements, and, ultimately, create more stable security conditions on the ground that are essential for peace,” he said. “As long as the status quo remains, Russia has no reason to change its behavior, and we should only expect more violence and more death,” he added. “We do not, and we will not accept Russia’s seizure of the Crimea. And despite Russia’s denials we know that they are seeking to redraw international borders by force,” he said. Russia, Ukraine, Germany, and France are working on a lasting ceasefire for eastern Ukraine by the beginning of the school year.